Here’s my list of what I consider the 20 Best Kitchen Gadgets for Foodies. Or least what I consider my top 20 Kitchen Gadgets, and I’m a Foodie so that counts right? These are my most used tools in the kitchen. Would love to hear about yours. The Cuisinart Cool Creations Ice Cream Maker has a 2 quart capacity, 3 different settings and comes with a 3-year warranty. We use this quite often at night to make my Keto Ice Cream. It’s a really good last minute, no-cook ice cream. I start it when we sit down to dinner and by the time we’re finished, and the table cleared, the ice cream is done. The Cuisipro Donvier Yogurt Cheese Maker converts 3 cups of yogurt into 1 cup of thick, creamy yogurt cheese in about 24 hours. I love this for the small amount of yogurt that I make, especially if I’m just draining a little to make Labneh or Shrikhand. The Masterbuilt Electric Smoker makes smoking simple with over 700 square inches of total cooking space on four chrome cooking racks and a remote control to adjust temperatures at ease. I must say, these thing are idiot-proof (i.e, me). The first time we got this, I randomly threw a piece of seasoned meat on it, without reading directions or anything, and it turned out amazingly well. I ended up making this Mexican-style smoked pork. It’s a little pricey but it has great reviews and I can see why. The GoWISE Electric Air Fryer allows you to prepare a variety of food without the added calories of oil. This air fryer is a great adjunct to my Instant Pot and I often use it to brown things like the Homemade gyros. But it sees plenty of use on it’s own as well, such as for Airfryer Cornish game hens, or airfryer ham. The KitchenAid 3-Speed Hand Blender let’s you blend, crush, chop, puree and whisk with ease. Okay I use this for so many recipes, it’s like my left hand. I use it for the Now and Later Keto Butter Chicken for the Low Carb Chicken Poblano Soup Recipe, and for many others. I just think these are so much safer for hot liquids than using a blender, as that can cause some safety issues. The Kuhn Rikon Swiss pull chop has sharp stainless blades that chop, mince or puree dips, sauces, soups, desserts and more in seconds. If you know anyone who has hand/mobility/dexterity issues, this thing is a blessing. I have Rheumatoid Arthritis and I often need help with cutting and chopping. This is the workhorse that I use. I’ve used it for Chana Salad, for a Pineapple Cucumber Salsa, and really for so many recipes, I can’t even keep up with them. The Microplane Classic Original Zester Grater is the perfect tool for grating citrus, garlic, ginger, cheese and fresh spices. I usually make a ginger garlic paste that doesn’t require me to grate on the go, but when I run out, this zester is super handy. I’ve had mine for years and it’s as sharp today as the day I bought it. I also use it for making Lemon Ricotta Cheesecake. The Mangocore Tofu Maker Press Mold Kit is a great kitchen gadget to have to make your own tofu, but I use it to make homemade Paneer. It makes the cutest little block of paneer, and it’s cheap enough that I don’t feel bad buying a one-use toy. The Zulay Metal Lemon Lime Squeezer gets every last drop out of lemons, limes and small oranges while keeping seeds and pulp out of your cup.So guess what I learned though? The typical way we all use these juicers? with the cut side facing down? Is all wrong. You’re meant to have the cut side facing UP, and the squeezer then acts like a bit of a reamer. It definitely gives you a lot more juice that way. I can’t believe I only just figured this out. The OXO Good Grips Julienne Peeler has a sharp, stainless steel blade that easily creates the perfect julienne strips. But I actually use these to make zoodles or cucumber noodles. It’s often a lot easier for me to use this rather than a full-blown spiralizer, especially if I’m just making a little bit. The Javelin Digital Instant Read Meat Thermometer is the gold standard for all digital meat thermometers and has a response time of 3-4 seconds. Okay I love this. It keeps me from overcooking things all the time. With a pressure cooker sometimes the meat can be pink, but it’s cooked. What I love about this is that it works very, very fast. I use it quite a bit. The Hamilton Beach Smooth Touch Can Opener opens cans of all sizes and is designed so the blade cuts along the side and not into the top of the can. I LOVE this. Find anyone who has any issues with grip, with inflamed fingers, no hand strength etc. and get them this. It is effortless. You barely place the can in there and it just zips around and gives you a clean cut on the can and there you go. Love it. The Bellemain Stainless Steel Measuring Cup Set are satiny smooth, they nest compactly together for easy storage and are dishwasher safe. I often eyeball things but not when I’m baking typically. I love how they nest into each other and save me some drawer space. The KitchenAid Blade Coffee Grinder makes quick and simple work of grinding beans for up to 12 cups of coffee. Yes but I never, ever use it grind coffee. This is actually my spice grinder and I use it for making homemade Garam Masala, Berbere, and a host of other things. The Micom Rice Cooker & Warmer not only cooks flawless rice but also comes with a steaming basket to double as a steamer and a cake menu setting to bake cakes. So full disclosure I don’t use this one. I make my rice in an inexpensive but fabulous $20 rice cooker that works beautifully or in my Instant Pot Mini Duo. But when I interviewed Sherlyn for the Faces behind the food feature, she said this was her favorite and so I thought I’d specify it here. The Philips Pasta Maker can make up to 1 pound of fresh and flavorful homemade pasta and noodles in just 15 minutes. Kim Anh mentions this in her Faces Behind the Food feature and I she has some incredible videos of it making the most amazing looking pasta. I think I gained 3 lbs just watching the video. Vitamix 5200 is the universal tool for creating every course of your home-cooked meal-from frozen drinks to creamy desserts-in just minutes. I hesitated for MONTHS before I was ready to put down the money for a vitamix. What could this think possibly do that my regular blender couldn’t? I was finally seduced into this by its ability to make soup and ice-cream. But really I use it to make protein shakes and puree for the Chicken korma, and every other thing you can imagine including Keto Cheesecake. One of my most used appliances in my kitchen. KitchenAid Artisan Series 5-Quart Tilt-Head Stand Mixer offers enough capacity to mix dough for 9 dozen cookies or 4 loaves of bread in a single batch. I don’t need to extol the virtues of a Kitchen-Aid to anyone I know, but I will say I’ve only recently really started to use it. I’ve used it make Keto cakes of course, but it’s surprisingly useful for making Gyros and Kababs as well. 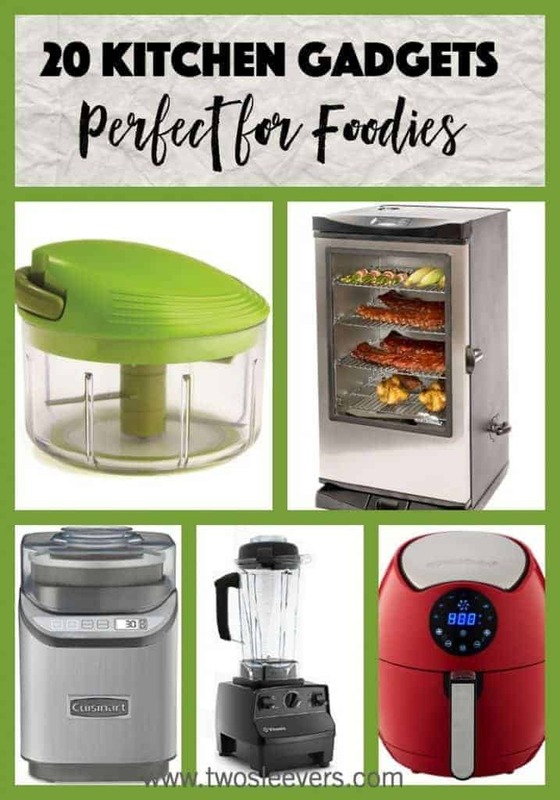 So those in a nutshell are my favorite appliances in my kitchen, and what I consider the 20 best Kitchen Gadgets for Foodies. What are some of your favorites?